More we are hearing the term Homophobia used, in the media, by employers and Trusts, and even in general conversation, but what is meant by it. The dictionary definition is fear of someone homosexual; but Julie Fish (Senior Lecturer and Research Fellow in Social Work at De Mortfort University, Leicester) doesn�t think it goes far enough to define the discrimination faced by Lesbian, Gay and Bisexual people. This is the argument behind her book. Fish argues, in her opening chapter, for the use of Heterosexism for prejudice/discrimination against LGB people. Her argument is, homophobia is seen as a personal fault, the prejudice of just one person, it doesn�t have the social/political element of sexism or racism, and therefore can be marginalised as the fault of the individual and not society. Changing to the use of Heterosexism also encompasses this social/political element. This might not be a new argument, originating in America, but Fish firmly roots her it in British culture and social/health care, making this book very relevant for British nurses. Other chapters analysis LGB health care needs (not just sexual health), how stereotypes feed into discrimination (not just negative ones), the barriers to LGB research (why often there is so little published), why information on LGB demographics are often poor, examples of Heterosexism from research, the last chapter is a review of this government�s legalisation that effects LGB people and the way forward for social equality. 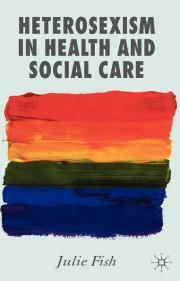 Though coming from a social care background Fish�s book has plenty to offer for nurses and healthcare professionals, especially challenging us in how we marginal LGB people often without thinking. Though an academic Fish�s tone in is very straight forward and readable, not the dry and uninteresting tone that often creeps into academic�s writing. The main drawback is its price (�45), which for such a concise book is very high � which sadly shows how little faith the publishers have in it. My advices, if you can�t afford it then pester your Trust�s library until they get. Certainly a must read for all in healthcare.